Hong Kong’s former chief secretary Rafael Hui was sentenced by the High Court on Tuesday of December 23 to seven-and-a-half years for corruption and misconduct convictions. Hui was ordered to pay the government of the Hong Kong Special Administrative Region (SAR) a fine of 11.182 million HK dollars ( about 1.437 million U.S. dollars). 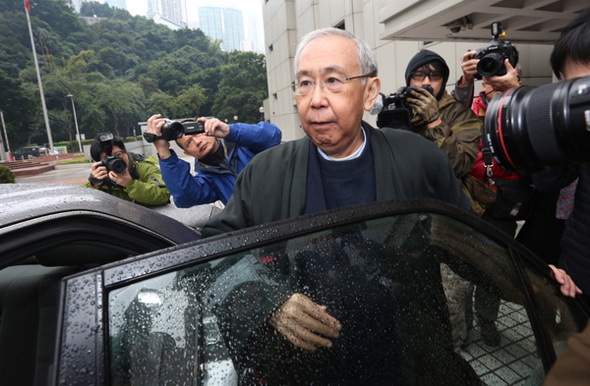 Hui was convicted of five counts of misconduct and corruption, making him the highest-ranking official in Hong Kong’s history found guilty of taking bribes. Each count carries a maximum prison term of seven years, as well as a fine. The judge said the ruling was made after considering mitigation arguments in court on Monday, including a plea of leniency from former chief executive Donald Tsang, for his ex-right-hand man. Former vice-chancellor of the University of Hong Kong Tsui Lap- chee also wrote to the court, setting out many of Hui’s contributions to the society. Sun Hung Kai Properties tycoon Thomas Kwok, 63, was jailed for five years and fined 500,000 HK dollars as he was found guilty of paying Hui 8.5 million HK dollars in bribes. Another two middlemen involved in the scandal – Thomas Chan was sentenced to six years’ imprisonment and Francis Kwan five years. Hui, born in 1948, is a former Chief Secretary for Administration of Hong Kong and a former career civil servant. He was arrested in March 2012 by the Independent Commission Against Corruption on suspicion of corruption. The trial of Hui and Kwok, which opened in early June, has been seen the most high-profile corruption trial in the history of the Hong Kong SAR. Hong Kong stocks ended down 0.32 percent on Tuesday of December 23, with the benchmark Hang Seng index falling 74. 88 points to end at 23,333.69 points after trading between 23,269. 43 and 23,495.62. Turnover totaled 78.03 billion HK dollars (about 10.03 billion U.S. dollars). The Hang Seng China Enterprises Index fell 66.28 points, or 0. 56 percent, to close at 11,677.74. Three sub-indices lost ground, with the Utility sub-index falling the most by 0.57 percent, followed by the Commerce and Industry 0.47 percent, the Finance 0.25 percent. The Properties closed flat. Banking giant HSBC, which accounts for the largest weighting of the Hang Seng Index, closed up 0.2 percent to 74.25 HK dollars, while its local unit Hang Seng Bank fell 0.5 percent to 127.70 HK dollars. Local bourse operator HKEX decreased 0.30 percent at 171. 50 HK dollars. Local developers Hang Lung Properties lost 0.9 percent to 21.35 HK dollars. Henderson Land, another major developer in Hong Kong, closed up 0.3 percent to 52.55 HK dollars, and Cheung Kong Holding, a powerful HK-based developer controlled by billionaire Li Ka- shing, climbed 0.2 percent to 129.90 HK dollars. As for mainland-based financial stocks, China Construction Bank, the country’s second largest bank which accounts for the third largest weighting of the Hang Seng Index, sank 1.7 percent to 6.22 HK dollars. ICBC, the world’s largest bank by market value, went down 0.4 percent to 5.53 HK dollars. Bank of China retreated 2.1 percent to 4.24 HK dollars. The gold price in Hong Kong went down 145 HK dollars to close at 10,940 HK dollars per tael on Tuesday, according to the Chinese Gold and Silver Exchange Society. The price is equivalent to 1,183.41 U.S. dollars a troy ounce, down 15.69 U.S. dollars at the latest exchange rate of 1 U.S. dollar against 7.75 HK dollars. Hong Kong has banned the import of poultry meat and products from Douglas County, State of Oregon in the United States, in view of a notification from the American authority about an outbreak of highly pathogenic H5N8 avian influenza in the noted area, the Center for Food Safety (CFS) said here on Monday of December 22. A CFS spokesman said Hong Kong will be in close liaison with the American authorities over the issue and will closely monitor information issued by the World Organization for Animal Health on avian influenza outbreaks in the country. Appropriate action will be taken in response to the development of the situation, the spokesman said. The spokesman said about 220,000 tons of frozen poultry meat and about 426 million poultry eggs were imported into Hong Kong from the United States from January to October this year. Hong Kong stocks ended up 1.26 percent on Monday of December 22, with the benchmark Hang Seng index rising 291. 94 points to end at 23,408.57 points, after trading between 23,264. 05 and 23,478.90. Turnover totaled 100.98 billion HK dollars ( about 12.98 billion U.S. dollars). The Hang Seng China Enterprises Index rose 343.83 points, or 3. 02 percent, to close at 11,744.02. Four sub-indices all gained ground, with the Finance sub-index rising the most by 1.72 percent, followed by the Properties 1.04 percent, the Utility 0.98 percent and the Commerce and Industry 0. 80 percent. Banking giant HSBC, which accounts for the largest weighting of the Hang Seng Index, closed up 0.7 percent to 74.10 HK dollars, while its local unit Hang Seng Bank rose 0.5 percent to 128.30 HK dollars. Local bourse operator HKEX increased 0.80 percent at 172. 00 HK dollars. Local developers Hang Lung Properties added 0.9 percent to 21. 55 HK dollars. Henderson Land, another major developer in Hong Kong, closed up 1.2 percent to 52.40 HK dollars, and Cheung Kong Holding, a powerful HK-based developer controlled by billionaire Li Ka-shing, climbed 0.2 percent to 129.70 HK dollars. As for mainland-based financial stocks, China Construction Bank, the country’s second largest bank which accounts for the third largest weighting of the Hang Seng Index, jumped 3.4 percent to 6. 33 HK dollars. ICBC, the world’s largest bank by market value, went up 3.4 percent to 5.55 HK dollars. Bank of China advanced 3.8 percent to 4.33 HK dollars. The gold price in Hong Kong went down 5 HK dollars to close at 11,085 HK dollars per tael on Monday of December 22, according to the Chinese Gold and Silver Exchange Society. The price is equivalent to 1,199.09 U.S. dollars a troy ounce, down 0.54 U.S. dollars at the latest exchange rate of 1 U.S. dollar against 7.75 HK dollars. Hong Kong stocks fell for a fifth straight day on Wednesday of December 17, led by casino shares. The benchmark Hang Seng Index moved down 84.66 points, or 0.37 percent, to close at 22,585.84 points, after trading between 22, 529.75 and 22,726.56. Turnover totaled 107.79 billion HK dollars ( about 13.91 billion U.S. dollars). The Hang Seng China Enterprises Index ended down 1.19 percent, or 132.53 points, to close at 11,269.43. Three of the four sub-indices fell. The Commerce and Industry ended 1.23 percent lower. The Properties lost 0.54 percent; the Utilities dropped 0.91 percent and the Finance rose 0.4 percent. Casino shares continued to lose ground as reports said that the central government will intensify its efforts to crack down on money laundering through casinos. Galaxy Entertainment Group plunged 8.2 percent to finish at 42 HK dollars. Sands China dropped 6.2 percent. Tech shares also posted lackluster performances. Lenovo group slid 4.15 percent to close at 9.93 HK dollars. Tecent fell for a fifth straight day, down by 2.5 percent to end at 105.3 HK dollars. Bucking the trend, mainland-based financial shares closed higher. The Bank of Communications rose 3.54 percent to 6.72 HK dollars; the Bank of China increased 2.7 percent to 4.14 HK dollars. The Banking giant HSBC, which accounts for the largest weighting of the Hang Seng Index, fell 0.07 percent to 72.55 HK dollars. It marked its seventh day of decline. Hong Kong stocks continued to lose ground on Tuesday of December 16, weighed down by heavyweights. The benchmark Hang Seng Index moved down 357.35 points, or 1.55 percent, to close at 22,670.5 points, after trading between 22,641. 06 and 22,944.28. Turnover totaled 91.24 billion HK dollars. The Hang Seng China Enterprises Index ended down 0.68 percent, or 75.75 points, to close at 11,136.9. All of the four sub-indices fell with the Commerce and Industry ending 1.98 percent lower. The Properties lost 1.42 percent; the Utilities dropped 1.15 percent and the Finance dipped 1.28 percent. Casino shares led the declines. Galaxy Entertainment Group retreated 3.58 percent to finish at 45.75 HK dollars. Sands China dropped 0.86 percent. Energy shares posted lackluster performances. China’s top refiner Sinopec ended down 2.3 percent to 8.06 HK dollars. PetroChina, the country’s largest oil and gas producer, slid 1.66 percent to 5.93 HK dollars. The Banking giant HSBC, which accounts for the largest weighting of the Hang Seng Index, fell 2.02 percent to 72.6 HK dollars. It marked its sixth day of decline and the 52-week low. The gold price in Hong Kong went down 154 HK dollars to close at 11,088 HK dollars per tael on Tuesday, according to the Chinese Gold and Silver Exchange Society. The price is equivalent to 1,200.96 U.S. dollars a troy ounce, down 16.68 U.S. dollars at the latest exchange rate of 1 U.S. dollar against 7.75 HK dollars. Hong Kong police on Monday cleared the last occupy site to put an end to the Occupy Movement which lasted for more than two months. The police swept off various make-shift barriers that the protesters had installed on an about hundred-meter-long main thoroughfare in Causeway Bay, one of Hong Kong’s busiest shopping areas ahead of the Christmas holiday. The Occupy movement started on September 28 when protesters blockaded several main roads and streets in Kowloon and Hong Kong Island to showed defiance to China’s top legislature’s decision on the election of the region’s next leader. The Occupy Movement caused serious traffic disruption, less tourists, temporary closure of schools and banks and a slump in local stock market trading besides a series of clashes between protesters and police. 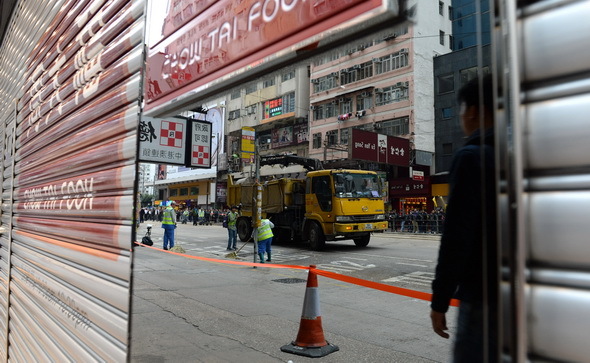 Before the raid to the occupy site in Causeway Bay, Hong Kong police and bailiffs had cleared occupy sites in Mong Kok and Admiralty successively. With the clearance of protest sites, all downtown traffic was restored on Monday of December 15. “To avoid large scale confrontations and bloodshed, police have exercised a high degree of tolerance and restraint in the past 79 days to deal with illegal acts of unlawful assemblies and illegal blockage of major thoroughfares at various locations in Hong Kong, ” said Commissioner of Police Andy Tsang, Hong Kong’s top-ranking police officer. However, police were forced to use the minimum level of force when confronted with violent behaviors and chaotic situations on nine days, Tsang told a press conference after the clearing operation, including the first day of the movement when police fired tear gas to disperse violent protesters. According to Tsang, a total of 955 persons have been arrested for committing various offenses relating to the illegal occupation as of Monday, and police will endeavor to complete the investigations, particularly the principal instigators, within three months. Another 75 persons surrendered themselves to the police in the past 79 days, according to Tsang. The Transport Department of the Special Administrative Region Government announced on Monday afternoon that all public transport services affected by the occupy movement have been restored. At the time, all financial counters, which were shut down during the past 79 days, have been reopened, according to Hong Kong Monetary Authority. 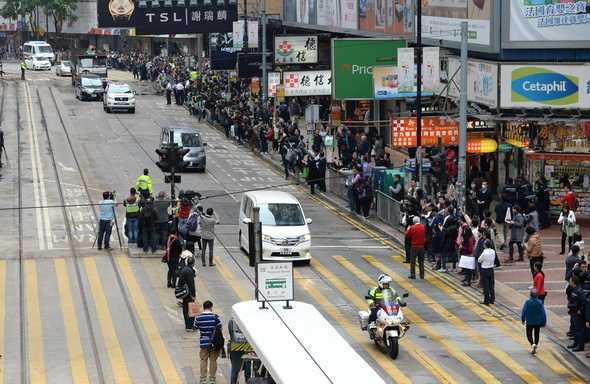 Many local residents applauded and hailed when buses, trams and other vehicles restored service on both directions of Yee Wo Street and Hennessy Road at Causeway Bay. A man at a bus station in Yee Wo Street complained that he had to spend an additional hour every day for commute during the occupy time. A saleswoman of a gold shop in Causeway Bay said that the shop’ s turnover dropped by more than 40 percent during the National Day holiday. And after the occupy sites have been cleared, the shop is preparing a series of sales promotion for the upcoming Christmas holiday. Hong Kong’s Chief Executive Leung Chun-ying said on Monday of December 15 that the worst impact that the occupy movement has brought to Hong Kong in the past days is the undermining to the rule of law. The democracy that Hong Kong and other advanced countries around the world pursue is a democracy under the rule of law, Leung said, noting that people should abide by the law in the first place no matter what their advocates and appeals are regarding the election of the region’s next leader. The Liaison Office of the Central People’s Government in the Hong Kong SAR issued a statement on Monday, praising Hong Kong police’s endeavor, dedication and professionalism in handling the Occupy Movement. “We hope all circles of Hong Kong society could cherish the hard-won stability and make concerted effort to support Chief Executive Leung Chun-ying and the SAR government’s governance in line with law, and rebuild Hong Kong’s social harmony after coming out the occupy crisis,” read the statement. Hong Kong stocks dropped 0.95 percent on Monday of December 15. The benchmark Hang Seng Index moved down 221.35 points to close at 23,027.85 points, after trading between a day high of 23,067.67 points and a day low of 22,856.02 points. Turnover shrank to 68.62 billion HK dollars (8.85 billion U.S. dollars) from last Friday’s 76.89 billion HK dollars. The H-Share Index moved down 23.74 points, or 0.21 percent, to end at 11,212.65 points. Banking giant HSBC ended down 1.4 percent at 74.1 HK dollars. China Mobile, China’s dominant mobile carrier, ended down 1.88 percent at 88.95 HK dollars. For Mainland lenders listed in Hong Kong, ICBC, China’s largest bank by market value, edged down 0.57 percent at 5.26 HK dollars. CCB, the country’s second largest lender by market capitalization, ended up 0.33 percent at 6.02 HK dollars. BOC, one of the “big four”, ended down 0.49 percent at 4.09 HK dollars. For local property developers, Sun Hung Kai, HK’s largest property developer by market value, ended down 0.79 percent at 112. 5 HK dollars; Cheung Kong properties, owned by billionaire Li Ka- shing, edged down 1.9 percent to close at 129.2 HK dollars. PetroChina, the country’s largest oil and gas producer ended up 0.16 percent at 8.25 HK dollars. Sinopec, China’s top refiner, ended flat at 6.03 HK dollars. China Life, one of the world’s largest life insurers by market value, ended down 0.37 percent at 26.65 HK dollars (1 U.S. dollar equals to 7.75 HK dollar). The gold price in Hong Kong went down 78 HK dollars to close at 11,242 HK dollars per tael on Monday of December 15, according to the Chinese Gold and Silver Exchange Society. The price is equivalent to 1,217.64 U.S. dollars a troy ounce, down 8.45 U.S. dollars at the latest exchange rate of 1 U.S. dollar against 7.75 HK dollars. Cargo volume at the Hong Kong International Airport (HKIA) rose 5.5 percent year on year to 421, 000 tonnes in November, a new monthly record for cargo tonnage throughput, the Airport Authority said on Sunday of December 14. The growth in cargo last month was driven by transshipments and exports, which were up 11 percent and 5 percent respectively from a year ago. During the month, cargo throughput to/from North America and Southeast Asia increased most significantly compared to other key regions. Continued growth was also seen in other traffic categories during the month, in which the airport handled 5.1 million passengers and 32,920 flight movements, registering growth of 5.4 percent and 4.0 percent, respectively, over the same period last year. The growth in passenger traffic in November was mainly driven by a 12-percent growth in transfer/transit traffic. Passenger traffic to/from North Asia and Mainland China recorded the most significant increases. “This is the first time HKIA has handled over 400,000 tonnes of cargo in a single month. This achievement further solidifies HKIA’ s position as the world’s busiest cargo airport,” said Julia Yan, general manager of Strategic Planning & Development of Airport Authority. In the first 11 months of the year, HKIA handled 57.7 million passenger trips, 4.0 million tonnes of cargo and 356,700 flight movements, representing growths of 5.6 percent, 6.3 percent and 5. 1 percent, respectively, over the same period last year. Hong Kong authorities cleared occupy sites in Admiralty on Thursday of December 11 and got the traffic in front of the government headquarters moving again before midnight. The clearance began in the morning at around 10:30 local time ( 2:30 GMT) after bailiffs read out to protesters injunction orders issued by the High Court of Hong Kong. The bailiffs and their aides successfully cleared tents, fences and other barriers in the occupied areas banned by the court’s injunction around noon, which was followed by a comprehensive clearing action in Admiralty taken by the police in the afternoon. 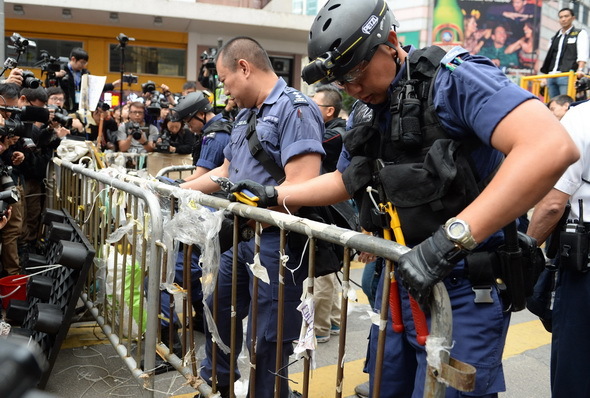 Police Senior Superintendent Kwok Pak-chung said earlier there was enough manpower to maintain order and they would not hesitate to intervene if the protesters resort to violence to interfere with the bailiffs’ work. The clearance barely met resistance and many protesters left the Occupy sites peacefully. But still a large crowd of protesters ignored the police’s appeal to withdraw from the protest sites and sat on the ground, shouting slogans. After repeated warnings, the police started to take away the sit-in protesters from around 16:30. According to Cheung Tak-keung, assistant police commissioner, the police arrested a total of 209 protesters during Thursday’s clearance operation. The arrested protesters included Alex Chow, a key member of the Hong Kong Federation of Students, and several Legislative Council members. The police also collected personal ID information of more than 900 protesters who stopped sit-in and left after the police cordoned off the illegal occupy areas. Those protesters may face criminal prosecution in the future. “If anyone attempts to occupy any roads again, the police will take resolute action for law enforcement,” Cheung told a press conference late in the evening. As of 22:00, the police completed clearing all barriers in Connaught Road Central, Harcourt Road, Tim Wa Avenue, Tim Mei Avenue and Gloucester Road. Traffic had been resumed in the Connaught Road Central and Harcourt Road, the main thoroughfares in Hong Kong Island, before midnight. The police said they would start clearing the last remaining Occupy site at Causeway Bay in Hong Kong Island at an appropriate time. The chaotic scenes have raised worries and irritation among Hong Kong citizens. Small venders close to the Occupy sites in Admiralty said that getting the traffic running again would help their businesses and they were concerned that the Occupy movement would affect consumer sentiment. “We have lost much sales in the past two months and only hope the society could restore order,” a florist’s shop owner in Admiralty told Xinhua. The Occupy protest in Hong Kong started on Sept. 28 and blockaded several main roads and streets in Kowloon and Hong Kong Island, which has resulted in serious traffic disruption, less tourists, temporary closure of schools and banks and a slump in local stock market trading. There had also been a series of clashes between protesters and police. A survey regarding the Hong Kong’s economic outlook for 2015 reveals that 40 percent of the respondents were pessimistic about Hong Kong’s future economy, while many said the Occupy protest stifles the its economic growth. Simon Wong, president of the Federation of Restaurants and Related Trades, told the media on Wednesday that more than 3 billion HK dollars (about 387 million U.S. dollars) of business loss was recorded in major business centers of Admiralty, Mong Kok and Causeway Bay, the main occupy sites, since the Occupy protest started in September. 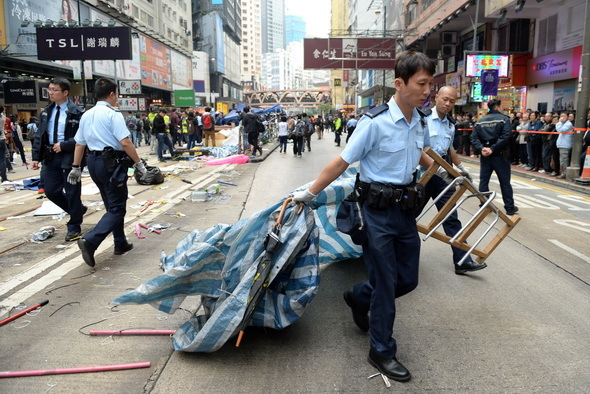 Hong Kong police assisted bailiffs in clearing the protest site in Mong Kok on Nov. 25 and 26. The main appeal of the protesters is to oppose a framework set by China’s top legislature on the election of Hong Kong’s next chief executive by universal suffrage slated for 2017. Under the Basic Law, the top legislature has decided that chief executive candidates to run the universal suffrage must be nominated by a 1,200-member nomination committee. China on Thursday of December 11 reiterated that Hong Kong affairs are part of China’s internal affairs, urging British lawmakers to stop badgering China for refusing to allow them to visit Hong Kong. “Hong Kong affairs are purely China’s internal affairs. China firmly opposes the interference of any country, institution or individual in any form in Hong Kong affairs,” said Foreign Ministry spokesman Hong Lei at a daily press briefing. According to Reuters, a group of senior lawmakers said on Wednesday that China’s refusal to allow them to visit Hong Kong last month was an insult to Britain and called on the government to react more strongly, including formally summoning China’s ambassador over the issue. The Chinese Mainland was the most important destinations for Hong Kong’s outward direct investment (DI) in 2013, receiving about 396.9 billion HK dollars, which accounts for 41.1 percent of Hong Kong’s outward DI at the end of 2013, according to the latest Hong Kong statistic report. The Census and Statistics Department of Hong Kong Special Administrative Region (HKSAR) government released Hong Kong’s DI statistics for 2013 on Thursday of December 11. The statistics said The British Virgin Islands (BVI) was Hong Kong’s second largest destination of investment, accounting for 39. 1 percent of the total position of Hong Kong’s outward DI at the end of 2013. Hong Kong’s total outward DI stood at 646.3 billion HK dollars, smaller than that of 683.4 billion in 2012. In the same year, the total DI inflow amounted to 596.1 billion HK dollars, larger than that of 580.9 billion in 2012. Taking the inflow and outflow together, a net outflow of 50.3 billion was recorded in 2013. The British Virgin Islands (BVI) was the major source of Hong Kong’s DI inflow in 2013, taking 33.7 percent of the total position of Hong Kong’s inward DI of the year. The Mainland came next, accounting for 31.9 percent of the total inward DI. The Mainland’s investment in Hong Kong covered a wide range of economic activities, including banking, construction; import/ export, wholesale and retail trades, and investment and holding, real estate, professional and business activities. A HKSAR government spokesman said the Chinese Mainland continued to feature prominently in Hong Kong’s external direct investment, both as a source and as a destination, accentuating Hong Kong as an ideal platform for both Mainland companies to go global and large multinationals to expand their business in the Mainland. Hong Kong stocks moved down 211. 98 points, or 0.90 percent, to close on Thursday of December 11 at 23,312.54 points. The benchmark Hang Seng Index traded between 23,169.67 and 23, 382.83. Turnover totaled 98.08 billion HK dollars (about 12.66 billion U.S.dollars). Dubai saw on Thursday of December 11 the listing of the very first Islamic bond or sukuk in its stock market by China’s Hong Kong Special administrative region. Hong Kong’s financial secretary John Tsang Chun-wah rang the bell to celebrate listing of the one-billion U.S. dollar sukuk. The listing marks Dubai as one of the top three listing venues in the world for sukuk, with a currently listed nominal value of 24.05 billion dollars. The Nasdaq Dubai competes with the sukuk hubs in Kuala Lumpur and in London. Dr. Nasser Saidi, a leading Dubai economist and former minister of economy in Lebanon said Asian economies can attract foreign investments from the Gulf Arab countries more easily through sukuk as Arab investors regard them as financing vehicle with lower risks and in line with their strategy to expand the Islamic finance industry. A total of 14.15 billion dollars of sukuks have been listed on Dubai’s exchanges so far in 2014, up 107 percent from 6.85 billion dollars in 2013. Sukuks do not pay interest but they periodically distribute profit shares of excess returns. Dubai aims to become the capital of the global Islamic economy, which according to the Dubai Islamic economy development center is going to rise from two trillion dollars last year to 3.7 trillion by 2019 as more non-Muslim countries jump on the bandwagon. Hong Kong’s Chief Secretary Carrie Lam on Wednesday of December 10 appealed to protesters to pack their belongings and leave occupied areas before Hong Kong police start clearance operations on Thursday. Secretary for Security Lai Tung-kwok said on the same day that the police are ready to reopen roads and restore public order on Thursday. Lai said police will help bailiffs enforce court injunctions on Thursday and reopen blocked roads in Admiralty. Speaking to the media, Lam said police will first assist in carrying out the injunction order and then clear obstacles to reopen roads. Lam called on parents, teachers, principals and university heads to contact protesters and students to persuade them into leaving occupied areas. Noted some student leaders have invited demonstrators to return to Admiralty on Thursday, Lam advised against the move as some radical elements might make confrontation unavoidable, despite the restraint and professionalism exercised by police. Lai urged protesters to leave the occupied areas peacefully by Thursday morning, and not to block roads, obstruct police or resort to violence. She also reminded students to leave as soon as possible and to stay away from troublemakers to avoid getting hurt during the police clearance. Lai reiterated that police officers would take resolute action against anyone who obstructs enforcement of the injunctions, blocks roads, charges at police or disturbs public order. Hong Kong stocks moved up 38.69 points, or 0.16 percent, to close on Wednesday at 23,524.52 points. The benchmark Hang Seng Index traded between 23,345.89 and 23, 656.51. Turnover totaled 109.93 billion HK dollars (about 14.18 billion U.S. dollars). Hong Kong police authorities declared on Tuesday evening of December 9 that the police force will clear all barriers at the protest site in Admiralty on Thursday and support bailiffs executing injunction orders on the unlawful occupation. Assistant Commissioner of Police Cheung Tak-keung told a press conference that the occupation has been affecting the daily lives of Hong Kong people for more than two months and the police must restore order. According to Cheung, all barriers blocking roads and pedestrian access on Connaught Road Central, Harcourt Road, Tim Wa Avenue, Tim Mei Avenue and Gloucester Road will be removed. The protest site in the Causeway Bay will be cleared later at an appropriate time, he added. Cheung urged the protesters to pack their personal belongings and leave the protest site peacefully as soon as possible since the police will not give them much time on Thursday. He warned the protesters not to resist or charge the police, reiterating that the police will take resolute action to preserve order and safety. The Occupy protest in Hong Kong started on Sept. 28 and blockaded several main roads and streets in Kowloon and Hong Kong island, which has resulted in serious traffic disruption, less tourists, temporary closure of schools and banks and a slump in local stock market trading. Hong Kong police has assisted bailiffs clearing the protest site at Mong Kok in Kowloon on Nov. 25 and 26. The main appeal of the protesters is to oppose a framework set by China’s top legislature on the election of Hong Kong’s next chief executive by universal suffrage slated in 2017. In accordance with the Basic Law, the top legislature has decided that chief executive candidates to run the universal suffrage must be nominated by a 1,200-member nomination committee. The gold price in Hong Kong went up 90 HK dollars to close at 11,150 HK dollars per tael on Tuesday, according to the Chinese Gold and Silver Exchange Society. The price is equivalent to 1,207.68 U.S. dollars a troy ounce, up 9.75 dollars at the latest exchange rate of 1 U.S. dollar against 7.75 HK dollars. Hong Kong stocks dropped 561.84 points, or 2.34 percent, to close on Tuesday at 23,485.83 points. The benchmark Hang Seng Index traded between 23,399.87 and 23, 934.02. Turnover totaled 144.19 billion HK dollars (about 18.61 billion U.S.dollars). Hong Kong stocks moved up 45.03 points, or 0.19 percent, to close on Monday of December 8 at 24,047.67 points. The benchmark Hang Seng Index traded between 24,012.15 and 24, 189.59. Turnover totaled 122.99 billion HK dollars (about 15.87 billion U.S. dollars). The Hang Seng China Enterprises Index ended up 272.93 points, or 2.35 percent, to close at 11,873.41. Three sub-indices lost ground, with the Properties ended down 0. 92 percent, the Utilities moved down 0.78 percent, the Commerce and Industry ended down 0.98 percent. One sub-indice gained ground with the Finance moved up 1.51 percent. The Banking giant HSBC, which accounts for the largest weighting of the Hang Seng Index, ended up 0.39 percent to 77.35 HK dollars. Bank of East Asia, one of the largest local banks in Hong Kong, ended down 0.16 percent to 31.05 HK dollars. Local bourse operator HKEX rose 3.32 percent to 183.90 HK dollars. China Mobile, China’s dominant mobile carrier, decreased 1.26 percent to 93.85 HK dollars, while another Chinese telecom giant China Unicom moved down 1.25 percent to 11.02 HK dollars. For the local property stocks, Sun Hung Kai, HK’s largest property developer by market value, ended down 0.61 percent to 114. 10 HK dollars; Cheung Kong properties, owned by billionaire Li Ka- shing, moved down 0.72 percent to 138.30 HK dollars. As for mainland-based financial stocks, China Construction Bank, the country’s second largest bank which accounts for the third largest weighting of the Hang Seng Index, ended up 3.89 percent to 6.41 HK dollars. ICBC, the world’s largest bank by market value, ended up 3.65 percent with 5.68 HK dollars. Bank of China erupted 4.60 percent to 4.32 HK dollars. Hong Kong customs seized about nine kg of suspected cocaine worth about 10 million HK dollars (1. 29 million U.S. dollars) at Hong Kong International Airport on Monday of December 8 and arrested two incoming passengers traveling together. The arrested persons, a 21-year-old man who claimed to be unemployed and a 20-year-old woman who claimed to be a cashier, arrived at Hong Kong from Sao Paulo, Brazil via Abu Dhabi, United Arab Emirates. Upon baggage examination, Customs officers found 12 cans of canned fruit in the female passenger’s checked-in suitcase. Subsequent to in-depth inspection, the cans were found containing the suspected drugs. The two arrestees will be jointly charged with one count of trafficking in a dangerous drug and appear at Tsuen Wan Magistrates’ Courts on Tuesday. Under the Dangerous Drugs Ordinance, drug trafficking is a serious offense. The maximum penalty is life imprisonment and a fine of 5 million HK dollars. Hong Kong customs said they will continue to keep track of the latest drugs trafficking trend and formulate pertinent anti- narcotics enforcement strategy. The Department will strengthen intelligence exchange with various overseas law enforcement agencies so as to combat transnational drugs trafficking activities collaboratively.